This blockbuster season, I’ve seen a few films that I felt that critics were rather unkind to. First there was John Carter, where various online critics piled on and called it “the next big flop”, possibly ensuring their predictions would fulfill themselves, and now there’s Lockout, an action film written by Luc Besson of Transporter and Nikita fame, starring Guy Pearce and Maggie Grace. and my suspicions were correct. It was. The premise: Guy Pearce plays Snow, an ex-CIA agent convicted of a crime he didn’t commit who is sent into an orbital prison where a gang of criminals lead by brothers Alex (Vincent Regan) and Hydell (Misfits’ Joseph Gilgun) have broken out of their stasis cells and taken over the prison, unfortunately at the same time as the President’s daughter Emilie (Maggie Grace) has been conducting a humanitarian visit to the prison as she’s concerned about the prisoners’ conditions. If Snow rescues her, he gets to go free with a clean record. So far, so very Escape from New York. One thing about the film is that yes, it does inevitably use a lot of action movie tropes and it is possible to spot movie tropes on loan from films as diverse as Fortress with the automated, seemingly inescapable prison to Snow’s gruff attitude and disrespect for authority figures which just screams Snake Plissken. The thing is though that I wouldn’t call Fortress or Escape from New York flawless classics but films that were good, cheesy fun. 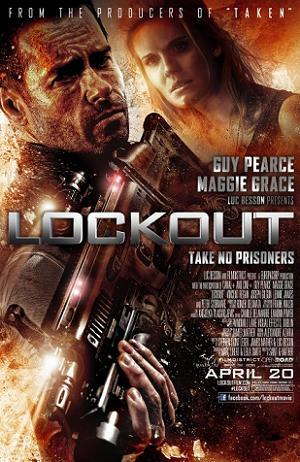 Lockout is in exactly the same mould as those two films, and it delivers the same thing that they do: good, cheesy fun. I’m not looking for breathtaking originality or deep meditation on the meaning of life when I go into a film like that: I just want to be entertained. And with those expectations, the film does just that. Guy Pearce as Snow is an entertaining protagonist and one who virtually winks at the screen as he goes through the prison, often commenting on the characters and events he encounters with some downright funny quips. He’s clearly having a blast in the role, and he’s immensely fun to watch. Maggie Grace as the President’s daughter Emilie isn’t given too much to do as she’s been lumbered with the role of Action Movie Girlfriend (namely, get captured a lot and look traumatized by events) but one thing that is quite good is her and Snow’s chemistry and it is quite entertaining to watch their relationship go from antagonisitc to barbed flirting and it’s good for several laughs (one of which is shown in the trailer above). The film was shot on a budget of $30 million, which is quite small for an action film these days, but the effects are good enough to be entertaining and overall if you want an unchallenging, fun ride it pretty much delivers. I think the critics have been pretty unfair to it, really and those who described it as “cinematic sludge” are wrong – Lockout is cheesy, undemanding popcorn movie fun at its best. Depends on what movie poster they promote. The “LOST” fans for sure will take a look!